Kiev has been making unrealistic demands for the rebels to meet before pulling back their heavy weapons, Russian Foreign Minister Sergey Lavrov said. It appears that some politicians in Ukraine and the West want to derail the Minsk ceasefire, he added. The Minsk peace deal has produced a noticeable reduction of violence in Eastern Ukraine, which is confirmed by OSCE observers on the ground, Lavrov said Thursday. But the progress may be reversed if the authorities in Kiev and their foreign sponsors maintain the confrontational stance they have now, he warned. “They are trying to stir hysterical moods and draw the attention away from the need to implement the Minsk agreement,” he commented on threats voiced by US Secretary of State John Kerry and the President of the European Council, Donald Tusk, to impose new sanctions against Russia. “They put forward ludicrous demands [to rebels] that go absolutely in line with what the Kiev authorities say. And they said they won't pull back heavy weapons until a full day or two without a single shot fired in Eastern Ukraine takes place. We all certainly know that there can be no perfect ceasefire,” Lavrov said. He added that some politicians in EU and US appear to be unwilling to put pressure on Kiev to stick to its side of the bargain in the Minsk deal. Moscow's stance in the conflict is clear, the Russian minister added. “The important thing here is not in placating this or that Western nation or Western official threatening us with sanctions. The important thing is to ensure peace and a stable resolution of the Ukrainian crisis,” Lavrov stressed. He called on the OSCE to step up its effort to monitor the movement of heavy arms on the ground. 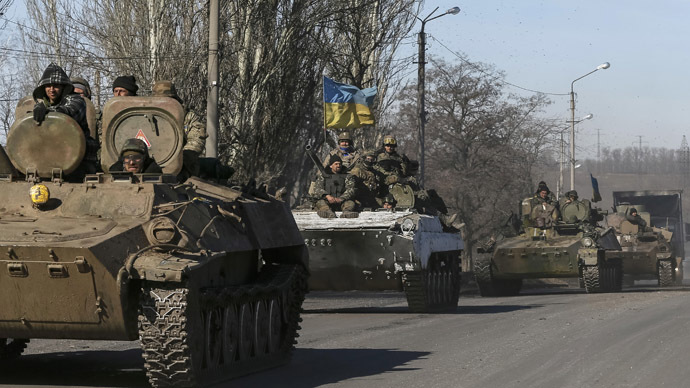 The Ukrainian side confirmed that it is not pulling back heavy weapons. Reuters news agency cited an anonymous source as saying that President Petro Poroshenko may order a withdrawal as soon as Thursday. But so far the situation remains unchanged. On a positive note, Kiev reported a significant decrease in the level of hostilities, indicating a possible withdrawal of arms by the Ukrainian side. “Over the past day we haven't recorded a single instance of taking fire,” military spokesman Andrey Lysenko said. He added that Kiev's troops had sustained no combat casualties for the second day in a row. The rebels, who announced pulling some of their weapons back over the previous days, said they are not trusting Kiev enough to order a large-scale withdrawal of arms. The militias say they withdrew at least 300 pieces of artillery and other military hardware from the disengagement line. The process is continuing Thursday, and OSCE monitors have been invited to verify it, a rebel military spokesman told RT. “Today at 10.00 am, an OSCE-monitored movement of our columns commenced. They recorded this movement,” Eduard Basurin said. But with Kiev stalling on their part of the bargain, their opponents suspect foul play. “Ukraine doesn't want to fulfill the obligations that we signed up to. This is obvious. There is a risk of resumption of the war,” the head of the self-proclaimed Lugansk People's Republic, Igor Plotnitsky, said. “The situation is serious. We are pulling back [our weapons] but the Ukrainian side shows no progress. Why don't they? Will they for the third time call off their signature [under the ceasefire deal]?” said Denis Pushilin, a senior official in the self-proclaimed Donetsk People's Republic. The warring parties in Eastern Ukraine have agreed to a defined disengagement line earlier in the week, the OSCE reported. Under the Minsk deal they are now required to pull back all heavy weapons from this line, a move required to reduce the risk of further clashes. The OSCE, which was mandated to monitor the implementation of the truce, reported that it lacks a date from Kiev and the rebels on the inventory and movement plans to properly verify the withdrawal of arms.